Join us on a journey to the dwellings of the 12 Greek gods! Mount Mitikas (2918m) is the highest point of the mountain of the gods – Olympus and the second highest point on the Balkan Peninsula also known as the crown of Zeus. Visible from the beach it is an easy-to-spot line that instantly grabs the attention of every mountaineer. The Alpine character of the mountain offers an interesting trek with a few technical sections. The hike will start with a deep dip into the rich and diverse fauna and flora of Olympus National Park. The Mediterranean climate and the different elevation zones have resulted in over 1,700 types of plants. Deciduous trees and bushes along with black pine and fir higher up in the mountain will accompany you throughout your adventure. At the top, you will find yourself surrounded by wildflowers and be able to experience the divine sunsets and sunrises. There will be a night spent at 2650m height in a high mountain hut directly below the magnificent Mount Stefani. In order to take part in this adventure, you will need to be in a good physical form and free of vertigo as there will be some spicy parts where we will need to do some scrambling. All guides for this trip are solid mountaineers certified by the UIMLA. This adventure can be also combined with a relaxing day on the beautiful beaches of the Aegean Sea. ~ Day 1 ~ We start in Thessaloniki or Litochoro depending on client preferences. Hike to Petrostrouga Hut at 1950m. Total walking for the day: 2,5 hours, + 900 m.
~ Day 2 ~ Hike to Mouson Plateau (2700m, 2,5 hours). We will reach the mountain hut where we will have a break and leave most of our luggage. 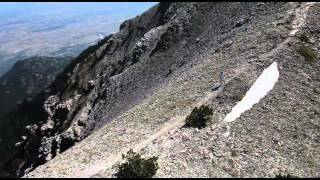 An ascent of Mount Mytikas (4-5 hours). Overnight at the mountain hut overviewing Mount Stefani. Total walking for the day: 7 hours, +970m / – 270m. ~ Day 3 ~ (optional) After an overnight in the mountain hut we ascent Mount Mytikas in the early morning. Stay for a night at the seaside or back to Thessaloniki. Total walking for the day: 4,5 hours, – 1550m.